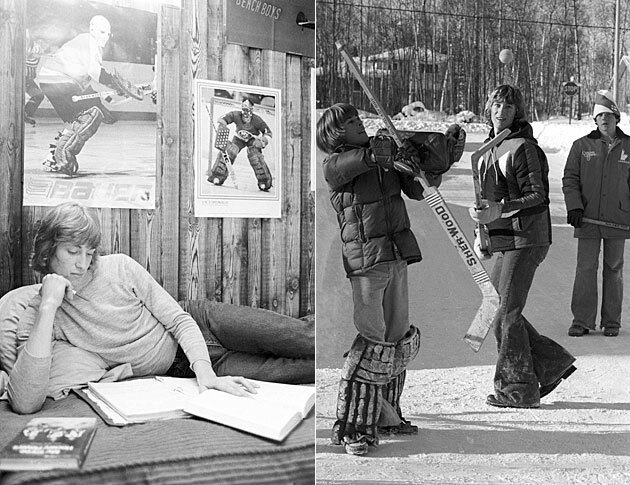 Hiawatha was Saul St. Marie’s first legend, but now the town hero is teen hockey phenom Wayne Gretzky: a 1978 Sports Illustrated feature story. As the 2015 NHL Draft and the arrival of two potentially generational players, Connor McDavid and Jack Eichel, loom, SI.com looks back at other notable teen phenoms with a series of features from the SI Vault. The fourth part of our series is this story, which originally appeared in the February 20, 1978 issue of Sports Illustrated. Links to the first three—Sidney Crosby, Eric Lindros and Mario Lemieux—are below. Subscribe to SI magazine here. Special Championship Offer: Get a Commemorative Chicago Blackhawks Book and Framed Cover. More than 7,000 people—the largest hockey crowd of the season in Canada’s capital—came to the Ottawa Civic Center one night last month to get to the bottom of a 16-year-old wunderkind who plays for the Sault Ste. Marie (Ont.) Greyhounds. His name is Wayne Gretzky. That’s with a Zed-K-Y, please. The immigration guy fouled it up when his grandfather came over from Russia. In Peterborough the next night, the same thing happened: largest crowd of the year even though the last-place Greyhounds provided the opposition. The night after that, it was the same story in Hamilton: first sellout of the year for a Junior A game, and in a blizzard to boot, everyone out getting stuck in the snow to see some kid called The Great Gretzky, whom every paper in Ontario has hailed as the next Bobby Orr since he was eight years old, 4' 4" and 70 pounds. Gretzky is not just another star of the future. He is there, Canada’s answer to Steve Cauthen and Nadia Comaneci, one of those rare youths who leapfrogs the stage where they speak of potential, whose talent is already front and center, which, incidentally, is the position he plays for the Greyhounds. Gretzky is only a rookie in the Ontario Junior A Major Hockey Association (OHA), a league in which the players range in age from 16 to 20, but he has exploded onto the Junior scene like no one since Guy Lafleur—and before that Orr. If Wayne Gretzky were never to play another hockey game, thousands of Canadian kids would remember him into their dotage. He is the stuff of their dream—that, lacking size, lacking strength, lacking speed, they, too, can somehow make it. Gretzky did. He now is a wiry (read “skinny”) 155 pounds spread over 5' 11", but he should fill out enough to keep the pros happy. Gretzky describes his speed as “brutal”–meaning slower than slow. All the speed in the family went to his 14-year-old sister Kim, the Ontario Dominion champion in the 100-, 200- and 400-meter dashes and a good bet to represent Canada in the 1980 Olympics. Gretzky’s shot is accurate, but far from overpowering. And if you expect to see him mucking it up in the corners, forget it. Still, without question, he is the most exciting Junior hockey player since Lafleur left Quebec City in 1971. “They compare me to Orr and Lafleur, and that’s very flattering,” says Gretzky in his best “shucks, who, lil-ol-me?” tone. “But basically, my style is different from anyone else’s.” True. Nevertheless, despite the qualifier, Gretzky lives quite comfortably with comparisons involving himself and Orr, Lafleur or any other superstar who comes to mind, including Cauthen. “We're both little runts who get a lot of publicity,” Gretzky says of the latter. Gretzky’s talent is all in his head. “He’s the smartest kid I’ve ever seen,” says Fred Litzen. Sault Ste. Marie’s one-eyed head scout who has seen a passel of talent over 40 years, even if he has missed half, as his friends suggest. Gretzky knows not only where everyone is on the ice, but he also knows where they’re going. Uncanny anticipation, people call it. While Gretzky’s straight-ahead speed is something less than overwhelming, his mobility makes him nearly impossible to check, and his quickness—“Oh God, he’s got terrific reflexes,” says Litzen makes him a superb forechecker in the mold of Bobby Clarke, the player after whom Gretzky models himself the most. Right now, Gretzky has a knack with the puck equal to anyone’s, at any level. “From the red line to their net I play a solid game compared to anyone in the NHL,” he says. And somehow such a statement from a 16-year-old does not have a cocky ring. It shouldn’t, because it’s true. One reason for the big commotion over Gretzky last month was his play in the World Junior Championships that were held in and around Montreal over the Christmas holidays. 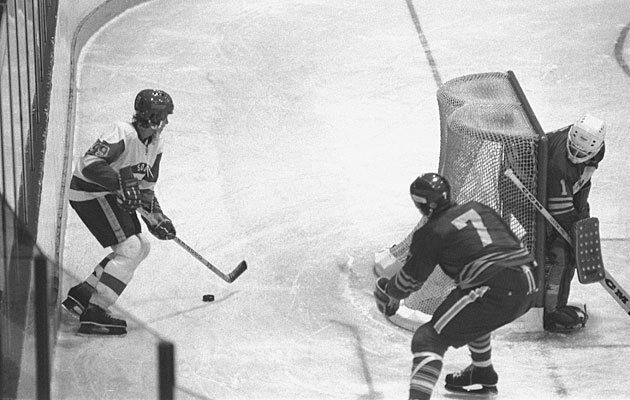 The youngest player in the eight-nation field, Gretzky led all scorers with 17 points (eight goals, nine assists) in six games. Team Canada, however, finished a disappointing third, behind the Soviet Union and Sweden. Gretzky was the host country’s only representative on the all-tournament team and became, if not a national hero, something of a national curiosity in a hockey-mad nation. Leading scorer at 16? Who is this Gretzky guy? It has been that way pretty much for Gretzky since he was five. That year he made the Brantford, Ontario novice all-star team, a squad usually made up of 10- and 11-year-olds. That led to an interview with the local television station at age six, a Toronto Globe and Mail feature at eight, a film clip on national television at nine. His career as a media darling was rolling. At 11 he scored 378 goals in 68 games, including three in 45 seconds in the third period of a game in which Brantford trailed 3–0. The legend grew, far faster than the boy. 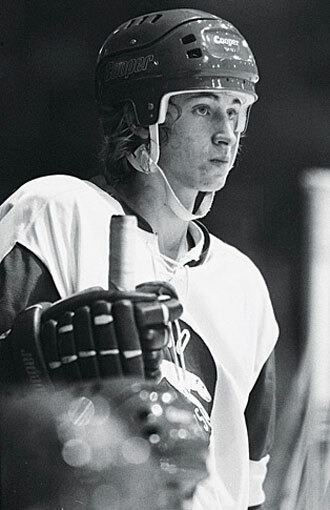 After being the third player selected in the midget draft held by the OHA last spring, Gretzky was expected to need time to adjust to the rougher, faster pace of the mother lode of North American hockey. He didn’t. He scored a hat trick in his first game with Sault Ste. Marie, and has been at the top of the OHA scoring race ever since. In his first 48 games Gretzky had 54 goals and 87 assists for 141 points. He already has shattered the rookie record of 137 points in a season (68 games) and may well break the OHA record of 170 points now held by Mike Kaszycki of the New York Islanders. 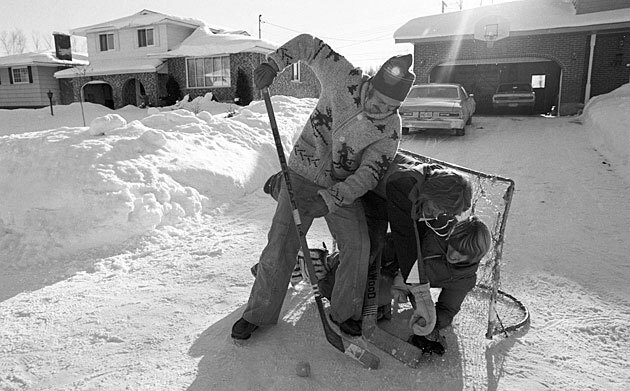 From the day Walter Gretzky strapped skates on his 2 1/2-year-old son Wayne and shoved him onto the flooded backyard rink, a comeuppance just hasn’t been in the cards. Harry knows all about capturing imaginations. Ask him to rate Gretzky, and he’s apt to tell you that the kid is the best Junior hockey player since Harvey Keck. That’s K-E-C-K, and no immigration guy fouled the name up—he’s part Indian. Plays for the Mekitina Purple Raiders. A professional scout once heard Harry talking about Harvey Keck and went so far as to get directions to Mekitina, which requires a dogsled and a clear night even in summer. A compass won’t work that far north. Keck’s only weakness is that he’s fictitious. “Hardest shot in hockey, and so fast he can play tennis with himself,” says Wolfe. Harry has been threatening to show Keck to his listeners for the past quarter century. “Looks like it’s time to bring up Harvey Keck,” he will say on the air whenever the Soo Greyhounds are floundering, a pretty regular occurrence in the six years they’ve been a major Junior A franchise. When Harry gets into a town, the first question he asks the bus driver is: “Harvey Keck still playing as well as he used to?” Most of them will nod and point to the sign that reads PLEASE DON’T TALK TO THE DRIVER. One, however, recently startled Harry by informing him that Keck had broken his leg and was out for the year. Although the Greyhounds were in the cellar, they trailed fifth-place Sudbury by just a point as they began their recent swing through Ottawa, Peterborough and Hamilton. But they were beaten 9–5, 8–5 and 9–3 on consecutive nights, extending their losing streak to six and making their playoff prospects dimmer. One would never know it to see the press flock into the dressing room after the games. To be a marked man in Junior is not a terrific honor. For every player trying to make it into the pros as a goal scorer, there are five or six trying to get there because they can hit people into next week. Then there are the delightful few who don’t worry much about next week, concentrating instead on, oh, the next three months in the hospital. Gretzky, so elusive on skates that he is nearly impossible to tag with a hard check, is subject to slashings across the wrists and legs that leave them a mass of welts after each game. Three times this season he has gone to the hospital for postgame X rays. The Greyhounds have loaded their bags onto a chartered, 30-year-old DC-3. Sault Ste. Marie is situated in Ontario approximately the way El Paso is in Texas, and the Hounds are the only OHA team to travel by plane. Next to Sudbury, which is a 186-mile stone’s throw away. Sault Ste. Marie’s nearest opponent in the 12-city OHA is 423 miles yonder. The crew is late, but has carefully remembered to prop open the plane’s door in the sub-zero cold. The interior of the DC-3 is lined with the recycled aluminum of old ice chests, and the players huddle in the seats like cubes in a tray. To pass the time, Muzz relates the story of the four-hour roller-coaster flight they took in November of 1975, the day the freighter Edmund Fitzgerald sank in a Lake Superior gale. “Thought I was a goner,” he says. Gretzky is used to the flak. He enjoys it, as he enjoys all the attention showered on him. It is a system of checks and balances devised by his teammates so that all the hoopla doesn’t go to his head. Earlier in the year, on a day he was scheduled for a television interview, Gretzky lost an eyebrow and some other, less visible hair to the razors of the Soo veterans. They also loaded his hair with Vaseline. The kid had been initiated. Undaunted, Gretzky had Sylvia Bodner, whose family he lives with in Sault Ste. Marie, apply her eyeliner to his brow and use steam, detergent, lemonade and Bromo—“Kind of made my scalp sore”—to remove the Vaseline in time for the evening news. In another ploy, the team had the Soo police arrest Gretzky for streaking. “I’ve got to call my agent,” he pleaded. He was innocently sitting in the back of the team bus in his shorts and sneakers when the police arrived. And in Ottawa a teammate, masquerading as a press secretary, phoned and asked Gretzky to lunch with Prime Minister Pierre Trudeau. Gretzky took a rain check, explaining that he had to eat a training meal. Bumbacco has been managing one team or another in Sault Ste. Marie for more than 30 years. Seventy of the players who grew up under him have gone on to college on scholarships, and 14 have ended up in professional hockey, among them Chico and Wayne Maki, Lou Nanne, Ivan Boldirev and—the local legends—Tony and Phil Esposito. The Gitche Gumee—Lake Superior—is an eerie white wasteland in winter. Freighters like the Edmund Fitzgerald, loaded with ore from the Algoma Steel plant, crunch through the channel cut out of the ice in Whitefish Bay. The city of 80,000 is as flat as the frozen waterways around it, and its rows of Monopoly-board houses are broken up only by the billowing smokestacks of the mill and Abitibi Pulp and Paper. It is here that the waters of Lake Superior, boiling into rapids, start their journey to the Atlantic. Hiawatha was Sault Ste. Marie’s first legend, back when the Ojibway nation called that stretch of the river “Pauwating.” He wasn’t much for hockey, but some of Longfellow’s descriptions make Hiawatha sound like something of a cross between Gretzky and Harvey Keck. Out of childhood into manhood Now had grown Hiawatha ... Learned in all the lore of old men, In all youthful sports and pastimes... He could shoot an arrow from him, And run forward with such fleetness, That the arrow fell behind him! Sam Turco is at the Sault Memorial Gardens the night Gretzky’s Greyhounds, as the Sault Ste. Marie team has been dubbed, try to break a seven-game winless streak in a game against Peterborough. He sits in the same seat he has occupied for 30 years, right behind the visitor’s bench. Sam came over from Italy in 1912 and worked 25 years at Algoma Steel before he lost his leg to a hangnail that led to gangrene and forced him to start driving a cab. A Hamilton forward has just trapped Gretzky against the boards and, surprised to have him pinned, rams the kid’s face against the glass for good measure. Ross Winslade, headmaster at Sir James Dunn School, which Gretzky and most of the other Greyhound players attend, is also at the game. He has a far better attendance record at the rink than they do at the school. “We’ve got to be honest with ourselves. They’re here to play hockey,” he says. “Their education is second. We do what we can.” He pauses. “Gretzky?” he says. “He’s an unassuming kid who’s doing a helluva job right now just rolling with the punches. I don’t worry about his kind of pressure. In a year or so he’ll be in my office talking about more money than I’ll make the rest of my life. “And if you’re not good enough for that, you go back to Sudbury and be a miner,” adds Rich Duguay, who, like McLeod, has been traded twice since the season’s opening. Gretzky is a lucky one. The luckiest of the lucky ones. Right now, the National Hockey League and the World Hockey Association have an agreement with the Junior leagues not to draft any players before they complete their Junior careers at the age of 20. For Gretzky, that will be 1981. But there is very little chance—make that zero chance—he will have to wait that long. His agent, Gus Badali, specializes in procuring six-figure contracts for underage Juniors. Wayne Dillon (now with the New York Rangers), John Tonelli (Houston Aeros) and Mark Napier (Birmingham Bulls) all signed with the WHA while being represented by Badali. And the talent-hungry, publicity-starved WHA will require little arm-twisting to bid for Gretzky. Last September, for instance, Birmingham ignored the established rules of drafting and signed 18-year-old Ken Linseman to a lucrative contract. The only serious questions are whether the pro leagues will wait until the kid is 18 (Gretzky turned 17 on Jan. 26) and how long and how lucrative his contract will be. Birmingham owner John Bassett, notorious for signing underage Juniors (Linseman, for one), has already waited nine years. He was an executive with CFTO television when he saw Gretzky play in a tournament among 8-year-olds. The kid is putting on a show for the home crowd. He scores five points as the Greyhounds beat Peterborough 6–3, avenging the previous week’s road loss. All the village came and feasted. All the guests praised Hiawatha, Called him Strong-Heart. Soan-go-taha! Called him Loon-Heart, Mahn-go-taysee!